(B) Poor standards of transportation, storage, treatment and disposal. As our cities grow in size and population, we are facing huge problems as generation of plastic waste and disposal. There are various solid waste management and disposal methods are now being used to resolve these problems. Garbage generation in household can be recycled and reused to prevent creation of waste at source and reducing the amount of waste thrown into the community dustbins. Because of this solid waste management is essential. 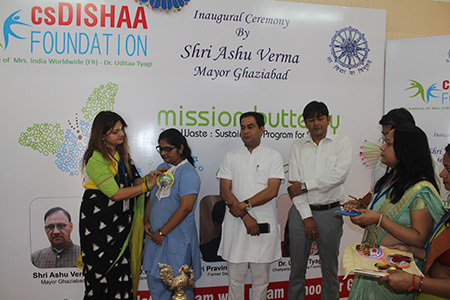 Mission Butterfly is a flagship project of csdishaaa Foundation, which has a mission to make 100 Zero Waste Sustainable School across Uttar Pradesh by the year 2022. An integrated solid waste management program (ISWM) promoting the whole-of-life (cradle to grave) management of solid material waste with strategies for recycling and its minimization has been undertaken India this banner.